The rumors are true. 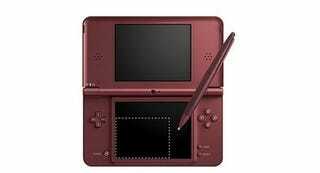 Today, at Nintendo's press event in Tokyo, the company announced a revised version of the Nintendo DS. Dubbed the Nintendo DSi LL, the new portable will feature a 4.2 inch screen. Priced at ¥20,000 (US$220) the DSi LL will be released on November 21. The "LL" refers to the extra large size. The redesign comes at the request of customers who said they wanted a larger screen, and the screen is a 93 percent increase over the DS Lite's screen size — the number of pixels is the same, however. The DSi LL is geared for those who want to use their Nintendo handheld for internet and as a music player as the larger screen is able to display letters and characters in a bigger font. The DSi LL is bundled with two touch pens: one shorter and one longer touch pen (129.3mm), and comes will three DSiWare titles pre-installed: Two brain training games (one for humanities, the other for sciences) and DS Easy Dictionary. Releasing in three colors, the DSi LL will be available in Dark Brown, Wine Red and Natural White.